Science Friday – Evolution | What is ML Reading? In honor of Banned Book Week, I decided to highlight a controversial subject… Evolution. I grew up in a certain place at a certain time. When I was in elementary school, a fellow Georgian was president. While researching for this post, I read Jimmy Carter’s written statement “As a Christian, a trained engineer and scientist, and a professor at Emory University, I am embarrassed by Superintendent Kathy Cox’s attempt to censor and distort the education of Georgia’s students,” The Department of Education in Georgia was trying to remove the word “evolution” from it’s curriculum. This quote is not from his presidential years, nor from any of the twenty something years after his election. It’s from this millennium; published on CNN on January 30, 2004. I don’t remember what I learned about evolution in school. So I visited the children’s non-fiction section to brush up. Surprisingly, a report titled Creation vs. Evolution fell out of the first book I opened. The notes were thorough and interesting. The final paragraph arguing, “the giraffe is a good example against evolution” was well-organized, but easily debatable. However, it was encouraging to see the full process – notes, outline, final paper. Back to the books on evolution. So many were overstimulating – photos, cartoons, charts, graphs, different fonts, several colors of text and at least three background colors on just ONE page. I saw this over and over in many of the books I checked out. Luckily, I found a revised edition of the Eyewitness Book Evolution on the shelf. I remember when the first editions were cutting edge in nonfiction publishing. Thank goodness they still exist and are being updated. A lot of today’s cutting edge nonfiction defeats the purpose of reading nonfiction to gain better understanding about a subject. They provide snippets of facts but lack depth. Anybody else agree? 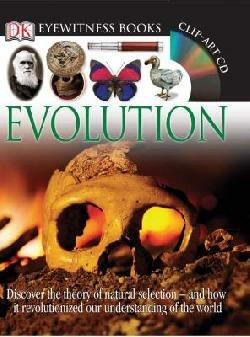 This entry was posted in Nonfiction Book and tagged Evolution, Eyewitness Books, Jimmy Carter by mlreads. Bookmark the permalink. If you are interested in the subject, you should read “Darwin’s Black Box” by Michael Behe. An excellent book, easy to read for most, also goes into more scientific detail in special sections for those who are interested. Behe is a microbiologist who, while not a believer, began exploring the problem of “irreducible complexity” first cited by Darwin. Meaning, if it were ever shown that a biological system existed that could not come into existence through a series of steps, but that all the parts had to be in place at once for it to work at all, then evolution would be completely disproven. Behe was shocked to find many examples of this irreducible complexity in nature. He cites 6 excellent examples in his book. Personally, growing up, it was my pastor who told me evolution was true. It was my engineering professors at GA Tech that showed me it was impossible scientifically speaking.